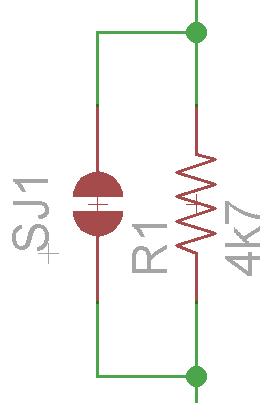 What is SJ in the following image in Eagle? Solder jumper link to short out R1 I think. Don't need a header or anything, you just have two pads to solder if you want to. A disadvantage would be that you actually have to solder/desolder it. So it's usually used as one-time jumper. To set an address or some setting perhaps. You simply put a blob of solder that joins the two pads. Use this instead of a switch or a "pins and shunt". It is used for a one-time turn on. Not easily turned off, but you can if you want to, badly enough.